After watching the enchanting sunrise over Mount Bromo yesterday morning, I headed back to the village of Cemoro Lawang, where I hopped on a minibus back to Probolinggo. At the main bus terminal, I bought a ticket to Surabaya from a man in the tourist ticket office. After buying my ticket, I sat on a bench outside to snack on some banana chips I had just purchased, and the man from the ticket office walked by and asked if he could have some. "Sure," I replied. He reached his grubby fingers in the bag and brazenly pulled out not one or two chips, but a huge handful that amounted to half of what was in the bag. It looked like he was on one of those game shows where contestants have to grab as much cash as they can while a fan blows it around inside a glass booth. I don't mind sharing, but come on! It was only $1.50 more for the air-conditioned express bus to Surabaya, so I splurged. It turned out that the weak air-conditioning was less effective than the open windows of a normal bus, but at least the express bus made it to Surabaya in two hours instead of four. I was in a seat next to the aisle, which was fortunate considering there was so little leg room that I needed to sit askew with one leg protruding into the aisle. Even in this position, my knees still poked quite far into the plasticy covering of the seat back in front of me, causing my knees to sweat so badly I had a rash by the time we arrived in Surabaya. I tried to ignore the cramped, sweaty conditions of the bus by enjoying some snacks, but I soon finished what was left of my banana chips and moved on to some fluffy cookies that turned out to have the taste and texture of insulation rolled in dry flour. At every stop, "musicians" with home-made metal guitars boarded the bus and sang appallingly out-of-tune songs, expecting to receive tips afterward. These performances were not like the pleasantly atmospheric accordion music of the Paris Metro. They were ear-splitting songs that lasted so excruciatingly long I felt like I was going to have a nervous breakdown and start screaming. One musician actually sat on me, putting his entire weight on my shoulder as he shrieked out his obnoxious noise directly next to my ear drum. Turning my iPod to its maximum volume didn't even begin to drown out the horrendous tune. These men were not musicians by any stretch of the imagination – they were simply trying to eke out a living any way they could. Nevertheless, when that little collection cup was shoved in front of my face, I felt like taking coins out of it for having to put up with the never-ending racket. In addition to the annoying musicians, snack vendors also boarded the bus at every stop, walking down the aisle and throwing snacks in the passengers' laps. If you don't want the snack, you have to shove it back in the vendor's face when he walks back down the aisle to collect payment. I quickly realized that the vendors usually didn't throw their merchandise in my lap if I feigned sleep. After two hours, the bus drove up an on-ramp onto a proper divided highway, the first one I've seen in Indonesia. Soon, we arrived at Surabaya's main bus terminal, which unfortunately lies quite a distance south of the city. I had to navigate my way to the proper public city bus to continue the rest of my journey. A sprawling, decaying metropolis spread out before us, becoming ever denser as we advanced into the run-down heart of the city. 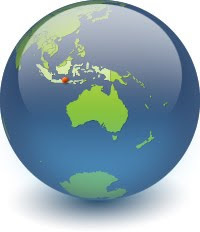 As the second largest city in the fourth most populous nation in the world, Surabaya is an overwhelming and chaotic patchwork of dilapidated Third World buildings, punctuated by a sprinkling of modern shopping malls and towering Western hotels. 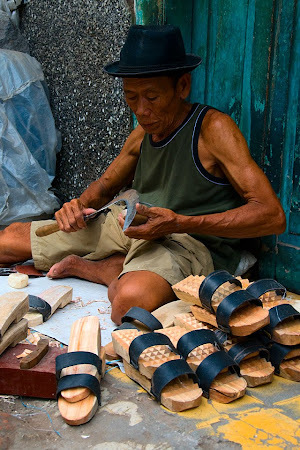 I hopped off the bus near the Chinatown area known as Kya-Kya, the closest thing Surabaya has to a tourist district – not that I saw a single foreigner my entire time in the city. As soon as I stepped off the bus with my large pack, I almost had to duck under a barrage of shouts – "Hello mister! Transport? Where you going?" – coming from a gang of cycle rickshaw drivers waiting like vultures for the rare (and highly lucrative) foreign tourist. Cycle rickshaws are know as becak in Indonesia, and I had little choice but to climb into one: I had only a vague idea where I was in relation to the hotel I was looking for, and I didn't feel like wandering the streets with a heavy pack in the heat of the day. I negotiated a price for what I knew was a short ride, but after five minutes I quickly realized that the becak driver was going in circles. I saw the sign for my hotel ahead, but my driver veered off onto an alley just before the hotel. I yelled at him to stop, but he continued for another twenty minutes in a loop through busy streets before finally listening to my incessant plea to return to the hotel. In many developing countries, taxi and rickshaw drivers often take tourists to places they did not request – a shop that will pay a commission to the driver if the tourist buys something, or a hotel that will pay a commission if the tourist books a room. It sometimes helps to insist on being taken directly to your destination, but drivers often take you to places that pay commission anyway. I'm not sure if this becak driver was attempting such a scam on me, but it definitely took much more time than it should have to reach my hotel. It's not like I could have jumped out of the moving vehicle the first time I saw the hotel sign. To make matters worse, when I handed the agreed-upon payment to the driver, he retracted his hand and refused to take the money. Instead, he requested 10 times the amount! Changing the fee after a ride is yet another common scam in developing countries, but at least I had control over this one – I was already at my destination. I placed the proper payment on the seat of the becak and walked away. Of course, the driver yelled at me to stop, but I continued walking. I turned around as he began to cycle away, and I saw a disappointed but accepting expression on his face – he knew I had paid a fair price. After checking into my bland (but air-conditioned!) room, I set out to walk around the city. Surabaya, like most all Indonesian cities, has no walkable sidewalks. Where sidewalks do exist, they are monopolized by parked motorbikes or workers unloading merchandise in front of shops. Sidewalk cafés are not the quaint variety found in Europe – they literally hog the entire sidewalk with cracked plastic chairs and tables. There is not even walking space next to the curb. That space seems to be reserved for parked cars or trucks, which often back out of their spaces without warning. All these obstacles force pedestrians to walk in the middle of the busy streets, avoiding traffic on one side and reversing vehicles on the other. Space is so limited on the streets that becak, motorbikes, and trucks drive dangerously close to pedestrians – so close that I was even clipped by a side-view mirror at one point. Crossing a road is an even more daunting task. Crosswalk signals are unheard of, and the lack of traffic lights creates a never-ending stream of cars with no gaps. The only way to cross is to unflinchingly walk into the traffic, holding your hands up as if you have magical superpowers that will stop cars in their tracks. Somehow, it seems to work. It is best to cross in the middle of a road rather than an intersection so you don't have to worry about turning cars. Of course, one-way streets are optimal. I visited a bustling fish market in Chinatown, where motorbikes squeezed through hordes of people crowding the narrow, crumbling alleyways. 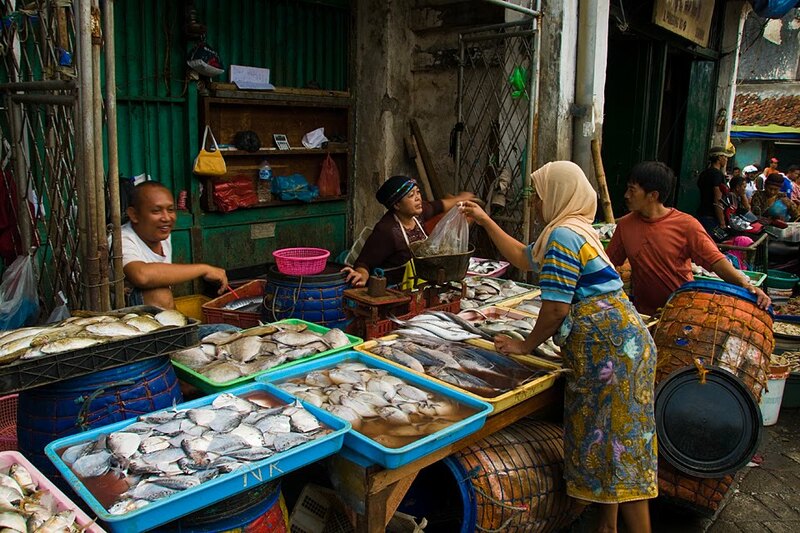 It was like any other Third World fish market I have visited, overflowing with the sight of fish both common and bizarre, the sound of vigorous haggling, and of course the unmistakable smell that can be detected from many blocks away. Foreigners must be a rare sight here, as children kept running up to me to give me high-fives (after which they usually asked for money). I wandered past the fish market to the Qubah, the city's Arab quarter. The area is packed with bazaars and several mosques, including the dominant Mesjid Ampel. 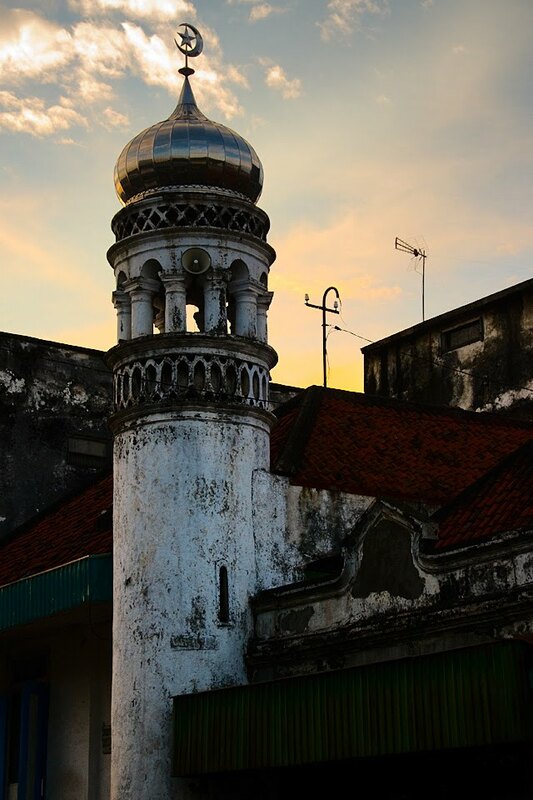 The alley leading up to this mosque is packed with stalls selling all sorts of religious clothing and other wares to the devout Muslims who stroll back and forth to the mosque from the main road. A couple of persistent beggar women followed me through the bazaar for a while, and one of the old women even grabbed my arm, holding on tightly until I shook her off. I had walked quite a distance to the Qubah, so I decided to take a becak back to my hotel. As always, I negotiated the price before I stepped into the vehicle, and unsurprisingly, the driver kept trying to veer off course to take me to some place that would probably pay him a commission for bringing me there. Luckily, I knew the way to my hotel, so every time he tried to deviate, I would say, "Hey, where are you going?" and point in the correct direction. After I caught him for the third time, he surrendered and said, "OK, OK, fine." He didn't try to make any more detours, and we were back at the main road near my hotel in a few minutes. I was not surprised when he tried to pull the common change-of-fare scam that my previous becak driver had attempted earlier this afternoon. I handled the situation in the same manner, placing the proper fare on the seat and walking away. Unfortunately, my tactic didn't work so well this time: the driver hopped off his becak, ran after me, and grabbed my arm. I explained that we had agreed on a certain price at the beginning, and that he can't change the fare – not to mention that he kept trying to take me on a detour. He didn't (or acted like he didn't) understand what I was saying. The argument was going nowhere, and every time I tried to walk away, he grabbed my arm tightly or blocked my path. He began to raise his voice and his eyes even teared up, but I refused to give in to this elaborate act designed to guilt me into being ripped off. Scam artists in developing countries know how to twist your conscience so that you feel like you are stealing if you don't consent to being ripped off. But not paying the driver what he asked is certainly not stealing; it's simply a matter of paying the pre-negotiated price. There is such desperation in developing countries that such scams do not seem wrong to these poverty-stricken people. To them, ripping off comparatively rich Western tourists is an honest way to make an income. Certain poor people may even feel that they are entitled to money from Westerners because there is such a gap in wealth. As people on the street began to stare at the escalating argument, and I began to feel extremely uncomfortable, an English-speaking Indonesian man finally walked by and intervened. I explained the situation, and the man translated my argument to the driver. The driver tried to argue that I had misunderstood the agreed-upon price, which was a lie, as I had negotiated the fee in Bahasa Indonesia in addition to holding up the corresponding number of fingers. The translator communicated this to the driver, who finally relented. The translator said that I had paid a fair price and was free to go. I quickly crossed the busy road, walking into the middle of four lanes of oncoming traffic and hoping that the vehicles would stop. As always, they did, and I slipped down an alley towards my hotel, weaving between motorbikes and parked vans to make sure the crazy becak driver didn't try to follow me. Persistent scam artists like that becak driver are extremely counterproductive, as they skew tourists' perceptions of their country and therefore convince potential travelers not to visit. Most people do not want to be in a constant defensive mode when they travel. I am passionate enough about experiencing the world that I recognize such unfortunate situations as part of traveling in developing countries. But I too have become bitter and jaded from having to constantly guard against being ripped off. I've become wary of anyone who starts a conversation with me, asks where I'm from, or even says hello. At the first sign of friendliness, I immediately switch into defensive mode and give short answers, or usually just ignore the person completely. The tragic part is that I haven't been wrong yet in being so callous and unfriendly. Every time, without fail, that "friendly" local has wanted my money. I don't think I've met more than a handful of people on my trip who have helped me without expecting anything in return. However, I mostly have contact with people who deal daily with tourists, like taxi and rickshaw drivers, and it is these people who are the most notorious rip-off artists. I'm sure that the locals in Indonesia, or any country, are mostly friendly – but that friendliness is difficult to access for foreign tourists. I try to always maintain that perspective, because if I let the endless scams get to me, I dread how hostile and distrustful I may become after six more months in Asia. It may be frustrating to be swindled out of a dollar here or five dollars there, but to many people in developing countries, that is a significant amount of money. Although the methods that destitute people use to rip off tourists seem extremely dishonest to us Westerners, I can't fault their tenacity in trying to squeeze a few extra cents out of comparatively wealthy tourists. They don't have many options when it comes to making money. And as bad as it is for rickshaw drivers to rip off foreigners, there are even worse lifestyles that the poor are often forced into in Asia, such as prostitution. Unfortunately, it is very easy to become demoralized in the face of such relentless poverty. After my sobering altercation with the becak driver and my walk through the crumbling, impoverished streets of Surabaya, I yearned for a different perspective on the city. Having had my fill of rickshaws for the day, I took a metered taxi to the House of Sampoerna Café, which provided a much-needed relaxing atmosphere. The air-conditioned interior of the historic building was tastefully furnished with designer décor and featured a well-stocked bar, trendy ambient lighting, and a flat-screen HDTV playing a World Cup match. A live band played on the patio outside, and chilled-out music enhanced the calm mood inside. Amazingly, my exquisite meal of spicy Singaporean laksa – featuring curry noodles, tofu, and generous portions of chicken and shrimp – was only $2. For dessert, I had banana fritters drizzled in caramel sauce with ice cream. It was the best meal I've eaten since Cape Town. Refreshed and full, I returned to my hotel ready to wash up and go to bed. Unfortunately, the cap for the spout that drains the mandi (water basin) was missing, so I had to wait for the slow trickle of water to fill up the plastic dipper each time I needed to dump water on myself to rinse the soap off. It took over half an hour for the whole ordeal, but at least I was clean and ready to fall into a deep sleep. Yesterday was an absolutely epic day: remember, it started at 3:30 in the morning when I awoke to watch the sunrise over Mount Bromo. As I try to digest the day's events and distill my thoughts about the becak scams and pervasive poverty, it would be very easy to say that I should not have come to Surabaya. No one recommended that I come here, and I knew that it was not going to be a very pleasant city, but I am glad that I have had the opportunity to experience a place that not many foreigners visit. 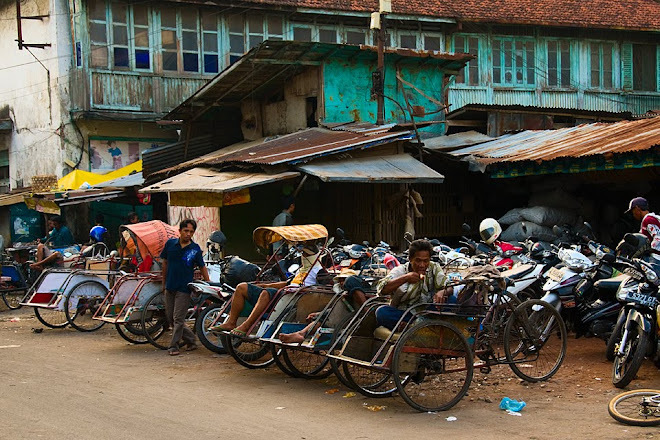 This massive, manic metropolis rewarded me with a true, unfiltered view of everyday life in an Indonesian city.